OWL and DL. Reasoning on the Web. Current state and remaining challenges. An explicit specification of the intended meaning of the vocabulary. 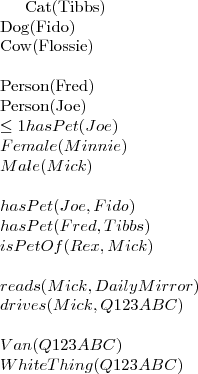 Description Logics are a family of knowledge representation formalisms. Their underlying idea is to represent the world of interest in terms of concepts, individuals and relations between them. Description Logics are related to semantic networks and frame systems. Contrary to them, thanks to their connection to First Order Logic, they provide a formal semantics and inference services. Terminology is definitorial if every base interpretation has exactly one extension that is a model of T.
an ABox is consistent w.r.t. a TBox T, if there is an interpretation that is a model of both A and T.
there are no mad cows!